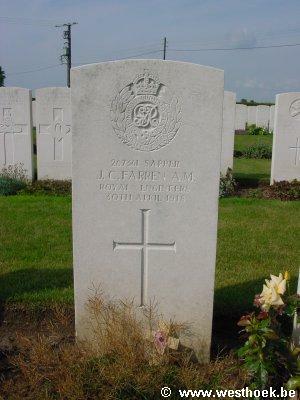 FARREN, Sapper, JOSEPH COLLINTON, A M, 267361. 12th Light Railway Operating Coy. Royal Engineers. Accidentally killed 30th April 1918. Age 23. 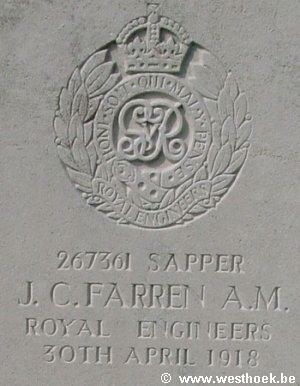 FARREN, Sapper, JOSEPH COLLINTON, A M, 267361. 12th Light Railway Operating Coy. Royal Engineers. Accidentally killed 30th April 1918. Age 23. Son of Mr. and Mrs. Farren, of Carlton, Market Bosworth, Nuneaton, Leicestershire. III. D. 33. The following particulars are given in "The London Gazette", No. 30,876, dated Friday, 30th Aug., 1918, of the acts for which the Albert Medal was awarded to C.S.M. A. H. Furlonger, D.C.M., Spr. J. C. Farren and Spr. 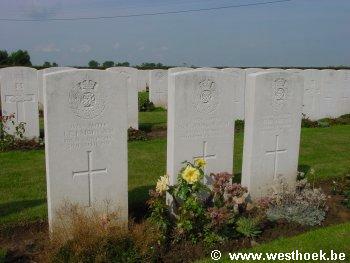 G. E. Johnston who are buried in this Cemetery, as well as to Lce. Cpl. J. E. Bigland and Spr. J. H. Woodman, all of the Royal Engineers :- "In Flanders, on the 30th April, 1918, a train of ammunition had been placed at an ammunition refilling point, and after the engine had been detached, and was being run off the train, the second truck suddenly burst into flames. Furlonger immediately ordered Bigland, the driver, to move the engine back on to the train for the purpose of pulling away the two trucks nearest the engine. Bigland did so without hesitation, and the engine was coupled up by Furlonger, assisted by Farren, while the burning truck was uncoupled from the remainder of the train by Woodman. The two trucks were then drawn away clear of the ammunition dump, it being the intention to uncouple the burning wagon from the engine and the first wagon and so isolate it, with the object of localising the fire as far as possible. The uncoupling was about to be done when the ammunition exploded, completely wrecking the engine and both trucks, killing Furlonger, Farren and Johnston (a member of the train crew), and seriously wounding Bigland. Had it not been for the prompt and courageous action of these men, whereby three of them lost their lives and one was seriously injured, there is not the slightest doubt that the whole dump would have been destroyed and many lives lost".